Halloween. It's the reason Haunted Overload exists today. Its creator Eric Lowther started haunting at the age of 12. Too old to trick-or-treat, he built his first haunted basement and got his first amateur scare. And he was hooked. In the autumns that followed, he built small home haunts or yard displays on the properties of friends, neighbors, and family. Each display growing more and more elaborate and demanding with each passing year. The haunt eventually took over his parents' home. Eric was living in a condo at the time and traveled back and forth to their 3-acre property to work on his display. But it became too much. The logistics, and the act of kicking his parents out of their own garage for two months, required a break. Eric sold his props and went on a two-year hiatus. After purchasing his own house in 1999, the Halloween display started again. It very quickly grew in size and scope, attracting hordes of people and raising thousands of dollars for the local SPCA charity. And it grew some more. A lot more. Haunted Overload's new size required a larger venue, and a new home. In 2006, the decision was made to turn his consuming hobby and passion into a business. The following year, the 78-acre Coppal House Farm in Lee, New Hampshire would be the answer. Haunted Overload now had the room it needed to grow. The farm provided an environment that suited Eric's organic and traditional (and over-sized) style perfectly. An environment that would take his Halloween display down the road to becoming a full-scale professional haunted attraction. Haunted Overload has already received accolades within the industry. In 2008, it earned the distinction by Haunt World Magazine of being named the number four haunt in the nation. 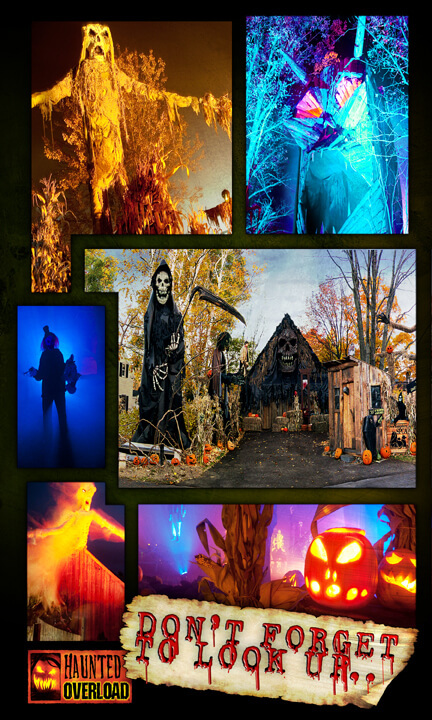 Powering and illuminating a haunted attraction in the middle of a farm is an impressive, and stunning, accomplishment. Haunted Overload requires five massive electrical panels disbursed throughout the multi-acred haunt. 6,000 feet of thick cable is required to light the entire attraction. Parking lot lights are used with black wrap foil cages and colored gels. The black wrap foil protects the gels from the intense heat produced by the lights. The gels are attached to the cages using gaff tape and sit approximately 1 foot away from the bulb. The black foil can be manipulated easily by scrunching and shaping to achieve beam placem ent, varying degrees of light, and unique lighting effects. Eric spends a great deal of time experimenting with the lighting of each scene. He feels the success of a scene depends upon the lighting of it. Colored gels are changed and switched out until the desired mood and atmosphere are established. The most dramatic effects come from placing the light fixture on the ground in front of a prop - a traditional flashlight-under-your-face approach, casting creepy, and massive, shadows on the old maple trees above. Hay bales are used to hide the fixtures, so the prop or scene can have all the brilliance of color without the blinding glare of a bulb. The stunning photographs in the image galleries on HauntedOverload.com can't prepare you for the first time you experience Eric's lighting techniques. It's a meticulous approach, and one that creates a seamless and breathtaking environment of color and shadow. Despite piles of bulbs and fixtures, and thousands of feet of wire, Eric still manages to run out of lights and wire each season. Purchasing more wire and more lighting supplies for the following year's haunt has become an annual tradition. Architectural LED lights, which possess the ability to change color and don't produce heat, are planned for the future, but are currently cost-prohibitive. The drive to Haunted Overload's location at the Coppal House Farm is the start of the attraction. Lonely roads and unnerving darkness carry you to the tree-lined drive that leads to the farm. No fanfare, no over-sized gaudy signs. Just a darkened bumpy approach with some hay bales and a few pumpkins. The arrival tells you this isn't going to be a haunted attraction. It's going to be something special. No massive flood lamps for parking, just layers and layers of stars overhead, and a pale yellow moon if you're lucky. The tops of trees off in the distance are illuminated with blues, greens, and reds.Then the sounds - people screaming, laughing, and the most delightful (and tasteful) music and sound effects. After being welcomed by friendly staff and exchanging online receipts for tickets, you're directed to a massive cornfield off to the right of the farm. And the Headless Horseman might be there, riding a dark and massive draft horse along the edge of the field and near the patrons in line. At the entrance of the corn, you're warmly greeted and given some advice - don't forget to look up. Truly the most appropriate advice ever. As you work your way through rows and rows of corn filled with unnatural sounds and creatures, you're struck by the isolated rural surroundings. Natural and organic, and a perfect way to prepare for Haunted Overload. The maze releases you onto what can be called Pumpkin Alley - a long straightaway of pure atmosphere - bales and bales of hay, sticks, branches, leaves, cornstalks, old wooden fences, torches, evil tree sentinels - and tons of jack o'lanterns (each lit with real flickering candles [that's VERY important to note]). You can FEEL the scent of toasted pumpkin as you're truly and completely surrounded by Halloween. Up ahead, the sweet smell of smoke reveals a disturbing prop - an old witch in a rocking chair, in the shadows. She rocks away impatiently and eerily, as her steaming iron cauldron rests above a real fire pit of flame and smoke. Then it's off into the dark world of Haunted Overload - a massive series of shadowy mazes and tunnels made of wood and cloth and pine boughs and branches. Glowing skeletons, tortured souls, vile creatures, over-sized scarecrows, and towering beings with skulls or flaming pumpkins for heads meet you along the way. 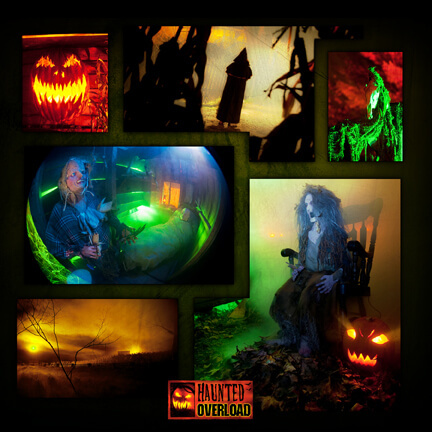 The acreage of Haunted Overload is stalked and haunted by a group of fantastic costumed actors. The queue line performers interact with the crowd at every turn in a noninvasive, playful, and very professional manner. The tunnels and mazes are filled with a different sort (though just as professional). Shrieks of horror and laughter precede and follow a maniac with a chainsaw. Madmen and the Undead stalk patrons through the darkness. The aroma of popcorn reveals a huge circus tent filled with creeping clowns. Haunted Overload relies on actors instead of animatronics. It's a human element that enhances the entire experience. Being surrounded by Haunted Overload, you realize just how much Eric loves Halloween. It's an over-sized home haunt, NOT a haunted attraction. The word "Overload" in the haunt's name isn't in reference to the towering scarecrows and creatures, but rather the detail that surrounds you. It's impossible to take it all in. Eric is obsessed with the detail. It's everywhere. It's in the shadows. It's over your head. It's on your clothes when you get back into your warm car for the drive home. The detail makes it hard to imagine Haunted Overload as just a seasonal October event. There's a solid permanence to it. It feels like it's always been there, and that it will be there all through the year...Giants waiting in the woods. Haunted Houses in Nashua, New Hampshire are some of the scariest haunted houses in America. Hauntworld.com tries to review only the best haunted houses in Lee, New Hampshire. 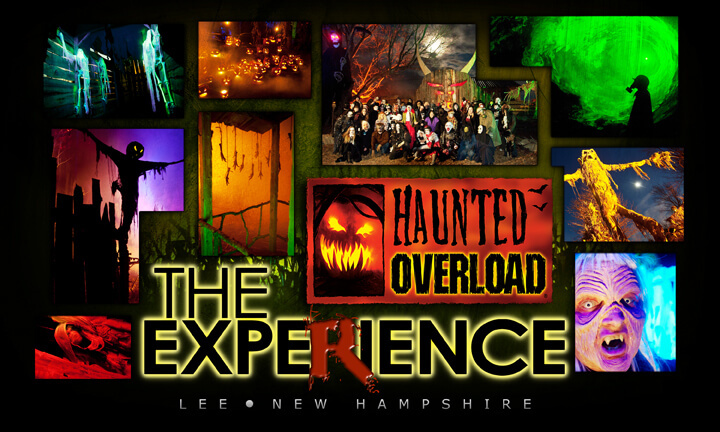 When you are looking for simply the best, scariest, haunted houses in New Hampshire there is no other place to search than Hauntworld.com which offers our guests the best information to find New Hampshire Haunted Houses including the best haunted attractions in Lee, New Hampshire. There are many haunted houses in Lee that claim to the best haunted attraction but only one can truly lay claim to the being the scariest haunted house in New Hampshire... Haunted Overload Haunted House in Lee, New Hampshire.